The nightly performance onboard Royal Caribbean Cruise Legend of the Seas is a must-see! 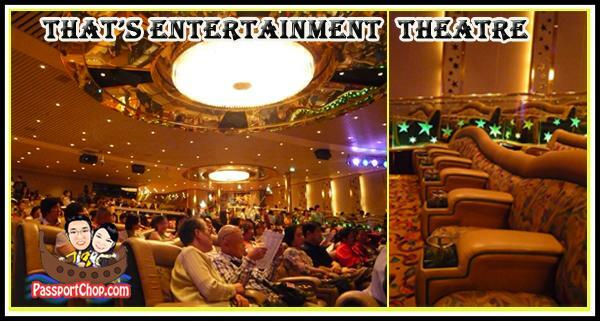 Get yourself a seat at the That’s Entertainment Theater, Deck 4 straight after dinner (if you are in the second seating at Romeo and Juliet restaurant ending at 9+pm) because by 10pm, the theater will be almost full and the good seats taken (and you are still 30 minutes away from the 10:30pm show)! The seats are quite comfortable so you can order a cocktail (not free) and wait it out. The shows are usually preceded by announcements of what’s happening tomorrow and cruise videos. 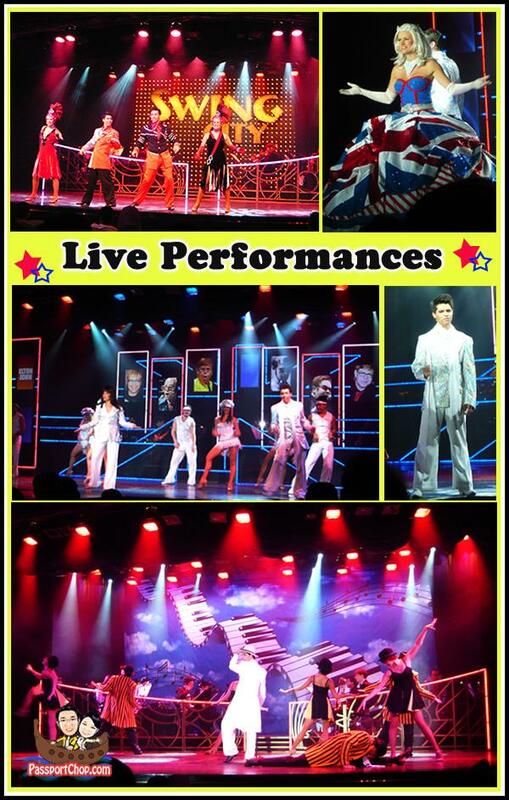 There are different performances for each night of the cruise, each with its unique costumes, songs and dances. The talented Royal Caribbean onboard singers and dancers would perform for the 1st 2 night of the cruise with different themes – Absolutely Feb: a collection of dances and songs covering songs of all genres from the United Kingdom & Swing City: all sorts of Jazz songs! Expect elaborate costumes and stage sets and of course, great dancing and singing! If you are fascinated by how fast the performers change their costumes and how the backstage looks like, you will get the chance to learn all these secrets during the Royal Caribbean Cruise Legend of the Seas Explorer Academy Back Stage Tour! You will get to check out the whole collection of wigs and costumes all squeezed into a small backstage. Also check out the setup of costumes and shoes that are prepared for the performers just before they come backstage to change. The secret to speed up each change? – Velcro! No buttons to fiddle with – just rip it and it comes off! For more info on cruises around the world, check out Cruise 1st cruise recommendations. Thanks for your blog. it is enjoyable reading and informative. i did the same cruise and had a really enjoyable and memorable time. Getting to go backstage is a real plus. The three cruise lines I worked for wouldn’t allow this. The performers work really, really, hard to put on a good show and getting to go backstage gives the passengers a good look at just what it takes to put on a good show.